The new Wrath of the Cosmos expansion has been shipped, and the official companion app has been updated to support it! Sentinels Sidekick 1.6 is now available on Google Play and on Amazon Appstore. Wrath of the Cosmos, the 3 new mini expansions, and all the new promo cards are fully supported. We’ve added support for Nexus 9 screens and made several bug fixes throughout the app. A new artwork pack is available for Wrath of the Cosmos and the other artwork packs have been given free updates with the new mini expansions and promo cards. If you have an iPad or iPhone, Sentinels Sidekick 2.4 is available on the App Store with full Wrath of the Cosmos support. A brand new feature allows you to toggle the highest/lowest HP indicators to show hero targets, villain targets, environment targets, and more. We’ve optimized the app for iOS 8 and iPhone 6+, and even reduced the storage space it uses! The new artwork pack for Wrath of the Cosmos also includes the new mini expansions, and all artwork packs have been updated with promo cards and super high resolution images for iPhone 6+. What’s next for Sidekick? Aside from minor maintenance and bug fixes, the next Sentinels expansion on the horizon is Villains of the Multiverse. It’s a mega-expansion featuring 10 Vengeance-style villains. Greater Than Games is running a pre-order for it until March 12th, so head over and reserve your copy! Sentinels Sidekick will be updated with support for Villains of the Multiverse around the time it ships. 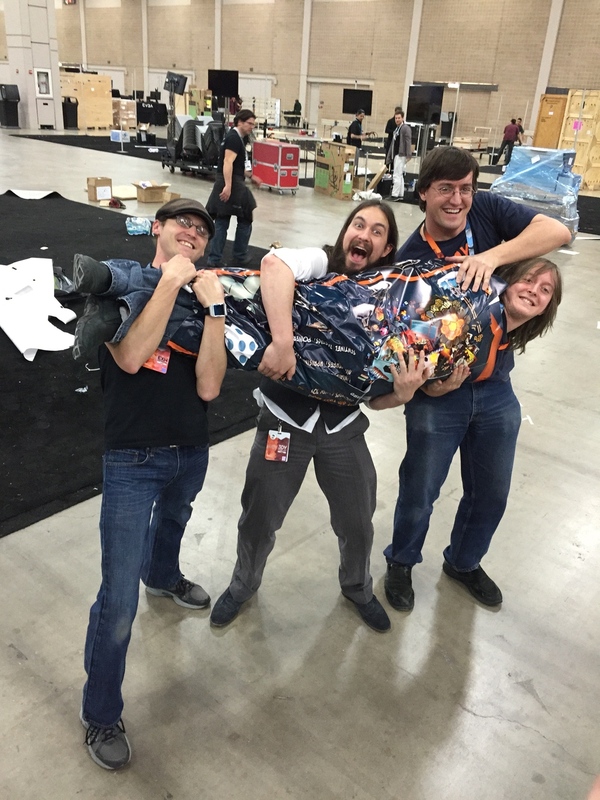 Jeremy recently returned from (a much colder than expected) San Antonio, Texas and the first ever PAX South. For many Texans, this was their first exposure to Sentinels, be it physical or digital, and the response was terrific. Easily more than 1000 people swung through the Handelabra/Greater Than Games booth over the course of the show and we gathered some great feedback. This was our first American show since we released the game and what we heard from you is that most people are really excited about the coming expansions, and also really interested in online multiplayer and a smartphone UI. The awesome volunteers made for a fun, fast and smoothly run show. Special thanks go out to Jim, Donner, and Brett! Now that both teams have returned to their respective home offices, we’ve finalized the shipping list for the Super Scientific Tachyon Steam launch promotion. If you were one of the lucky ones who signed up for a card, we expect those to ship within the next week or so. Start watching your mailbox! United States shipping addresses should see them pretty quickly but international recipients might take a couple weeks. Please be patient, your card is on the way! And finally, the first expansion update for Sentinels of the Multiverse is in beta testing and will soon be submitted to Apple for review. We can’t promise a specific date, but the average approval time is around 8 days right now. Within just a couple short weeks, you’ll all be using Unity to show Ambuscade who’s boss at Silver Gulch! For more info, check out these two posts about the expansion schedule for 2015. You can get a preview of the new decks in action by watching our weekly live streams. That’s it for now - onwards and upwards!